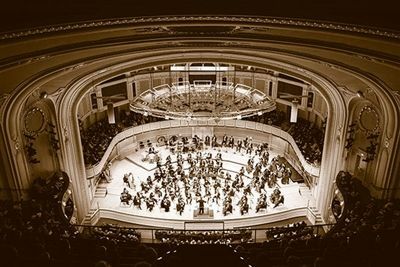 If you're a lover of the arts, you won’t want to miss this behind-the-scenes tour of two of our city’s world-class cultural treasures: the Chicago Shakespeare Theater and the Chicago Symphony Orchestra. Our day will begin at The Yard—Chicago Shakespeare’s newest indoor theater at Navy Pier. This bold new creative space replaces static seating with nine mobile “audience towers” that can be moved on compressed-air skids (like a hovercraft), enabling a crew of three technicians to effortlessly transform the theater into a dozen different configurations that can accommodate a variety of audience sizes and artistic visions. More than 200 architects, engineers and designers, as well as 400 construction workers, pooled their expertise to create The Yard. Described by Crain’s Chicago Business as “mind-blowing...a theater where the seats can literally float in midair and the stage can morph into just about any shape imaginable,” The Yard connects to Chicago Shakespeare’s existing building via a sweeping, two-story lobby with a curving wall of computer-controlled electrochromic glass (also known as smart glass or dynamic glass) that starts out clear and darkens to an energy-saving tint as the sun moves across its surface. After we tour this extraordinary new space and its sister venues on the three-theater Chicago Shakespeare campus, we will travel to the Symphony Center to enjoy lunch in a private dining room with panoramic views of Millennium Park and the lakefront skyline. Our cultural expedition will culminate in a backstage tour of the city’s century-old Orchestra Hall, the Georgian Revival auditorium designed by Chicago School architect Daniel H. Burnham. The bus tour is only available for those subscribers that purchase the four lecture series. A waitlist will be taken if space becomes available for the bus tour, with priority given to four and two lecture series subscribers. Please contact Joan Schniedwind at jschniedwind@loy.org to be placed on the waitlist.